The discussion around microcredit has become more nuanced of late; praise has given way to a more cautious examination of its challenges and opportunities. The June launch of Resilience: The State of the Microcredit Summit Campaign Report, 2014 constructively contributes to this debate through chronicling the growth and changing nature of the industry. The report touches on two main themes that are critical for microcredit’s future: the measurement of poverty and impact, and the diversification of product options. Measure: who are the poor and what does microcredit do for them? 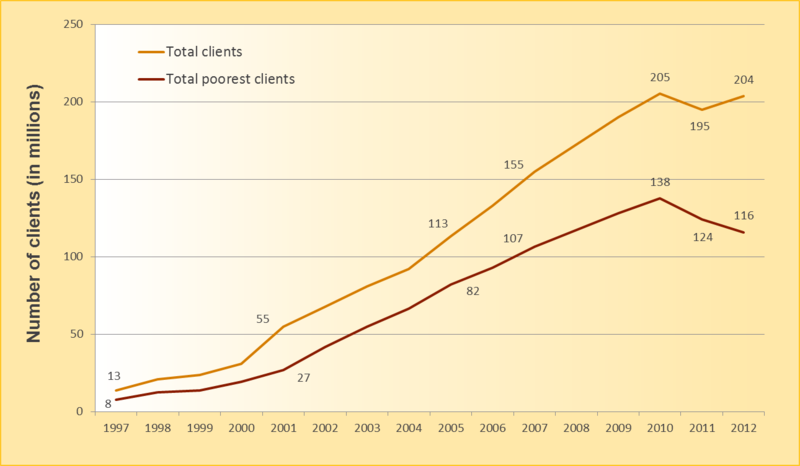 The global number and profile of microcredit clients has been in flux over the past four years. The microcredit industry seems to have recovered from the Andhra Pradesh Crisis of 2010 in India, with a return to 2010 peak levels again in 2012 reaching 203.5 million clients. By contrast, the proportion of poorest clients—those families either in the bottom 50% of the population living below the country’s poverty line or living on less than 1.25 USD a day—seems to be gradually declining. The report argues that this divergent trend, which at first seems curious and concerning, is likely due to the spread of improved poverty measurement tools rather than a real change in the client base. Put another way, microcredit may not target the world’s poorest as effectively as was once thought. The question of who microcredit affects is an important debate that should go hand in hand with a closer look at what microcredit can do for the lives of its clients. At the June 19th report launch event in Washington, DC, we presented findings from two recent evaluations of microcredit that were completed by IPA research affiliates. Echoing results from a broader set of randomized evaluations of microcredit programs around the world, these two studies tell a story of positive, though not transformative, results. In Mexico, 18-34 months after the expansion of group microcredit for women in randomly selected communities, existing businesses expanded. The evaluation shows that while there were no effects on profits or household consumption and borrowers accumulated fewer durable assets, female clients also bought fewer temptation goods (such as cigarettes, sweets or sodas) and increased their decision-making power within the household. In India, researchers measured the impact of giving women access to a similar group microcredit program. Based on survey data collected 18 months and 3 years after the randomized expansion, the results showed that microcredit led to an increase in assets and higher profits, but only for those businesses which were already quite profitable before the intervention. As in Mexico, temptation goods were curbed but in India this seemed to be in favour of an increase in durable assets. Undoubtedly, understanding who comprises the client base of microcredit is a positive step. However, the nuanced effects from the rigorous impact assessments mentioned above affirm that understanding microcredit’s true impact is more complicated than simply counting how many loans are being disbursed to low-income clients. An important recommendation of the report concerned the importance of diversification of the traditional microcredit model, providing additional services in health and education, supporting agricultural value chains, and offering a broader suite of financial products. This is an acknowledgement of both the complexity of the financial portfolios of the poor as well as the growing evidence of the promise of other financial services and innovations. As Priya Jaisinghani from USAID’s Digital Development team stated at the report’s launch event, digital channels can improve the impact of financial services, including credit. For example, SMS messages are one possible channel for client services. In Uganda, SMS reminders were shown to be as effective at improving loan repayment as a significant reduction in interest. Beyond SMS, digital channels can offer innovative payment mechanisms such as those already deployed in a number of countries. Finally, the digitization of finance generates a rich set of administrative data which practitioners and policymakers can responsibly utilize to design products and policies that further benefit the poor. At the same launch event, Sadna Samaranayake from BRAC USA identified in BRAC’s Graduation Programme another route for diversification of microcredit. The programme targets the ultra-poor with the intent to help them “graduate” to increased access to financial services and social integration, filling a crucial gap in choices for a segment of the population often overlooked by microcredit. The pre-microcredit intervention gives the recipients productive assets such as livestock, short-term weekly income transfers to aid consumption, and a variety of complementary services. The approach has shown promising results in Bangladesh; an evaluation there showed for those communities randomly selected to participate, after four years, increases in earnings by 38%, consumption by 8%, and investment in land by 38%. This promising evidence has led to a spread of the approach to the Middle East, Latin America and Africa. IPA is currently working to rigorously evaluate this graduation approach in a number of countries, data is coming in this year and we expect to have full results in 2015. IPA continues to look beyond traditional microcredit by supporting a number of relevant research projects that cover a wide spectrum of innovative financial products for the poor as part of its Global Financial Inclusion Initiative. The Initiative’s two Research Funds currently support more than 40 studies, with a promising array in the pipeline, that address the evidence and innovation gap in financial services for the poor. For example, one group of researchers is leveraging mobile network penetration in Afghanistan to evaluate the impact of access to a defined-contribution mobile savings accounts for employees. By generating evidence on services that work to improve the financial lives of poor households, IPA aims to further contribute to this evolving discussion. The 2014 State of the Campaign Report and its related launch event focused on two critical changes in the microcredit industry: improved measurement of its clients and their outcomes, and the diversification of the industry through partnerships and complementary services. As the industry matures, rigorous research and evaluations can be a key tool to develop and test innovative programs and financial products for the poor. Ayso van Eysinga is an intern and Aaron Dibner-Dunlap is an Initiative Manager with IPA's Global Financial Inclusion Initiative. Improving Loan Repayment through Positive Incentives in Uganda, Mobile-izing Savings: Defined-Contribution Savings on a Mobile Money Platform in Afghanistan, Microcredit for Women in Mexico, Evidence from a Randomized Evaluation: The Miracle of Microfinance?